A real seven day trail ride staying overnight at a variety of guest houses, inns and B&Bs. A stunning circumnavigation of the Great Cambrian Horse Trail network. Covers around 100 miles with no route repetitions with an optional rest day. We all look forward to welcoming you on The Radnor Ronda Trail . . .
A spectacular trail ride . 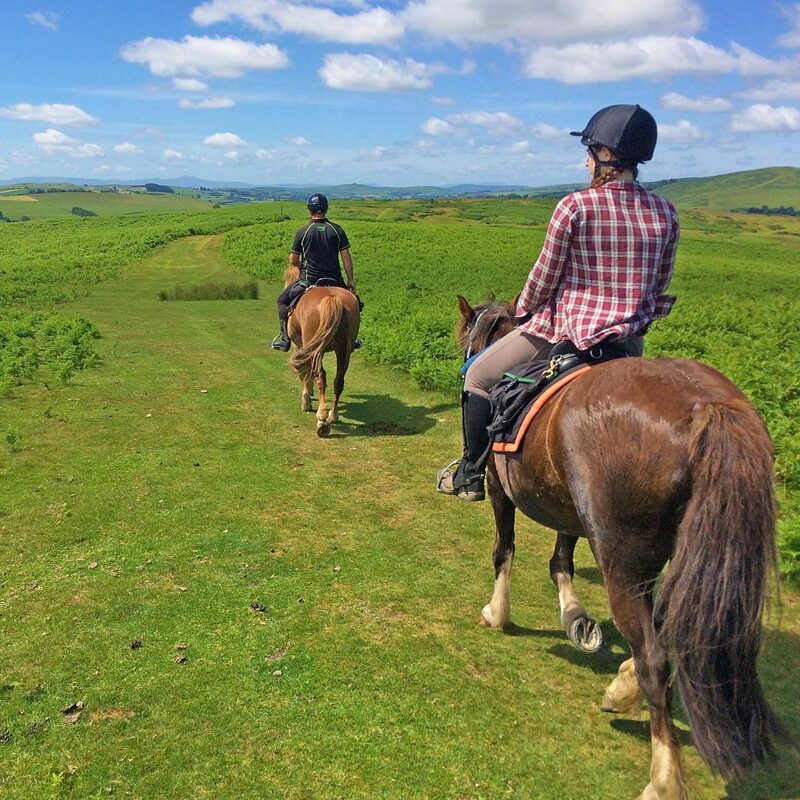 . .
A classic Freerein route & horse riding holiday. This ride circumnavigates the main area of the Great Cambrian Horse Trail network. Covering around 100 miles no part of your route is repeated. An amazing adventure . . . Your seven day adventure through Mid Wales takes in a large variety of terrain and accommodation places. Starting at Freerein HQ you travel over open hill, through forests and secluded valleys, ford streams and canter over heather covered moorland. All the days are between 14-18 miles per day with options to vary the route on this horse riding holiday. The Radnor Ronda travels extensively through both Radnorshire and Brecknockshire. These are two of the thirteen historic and former administrative counties of Wales. Both were abolished in 1974 and transferred their administration to the new county of Powys. Poverty and agricultural change, decline and industrial progress elsewhere has always made Radnorshire and Brecknockshire places of net emigration. This makes these areas the least populated of England and Wales. You can still ride all day without seeing anyone, just your trusty steeds, riding companions and the occasional Red Kite for company. Optional Rest Day . . .
You have the option of taking a rest day on this horse riding holiday. It can be taken at any point during the trip and must be arranged when booking. 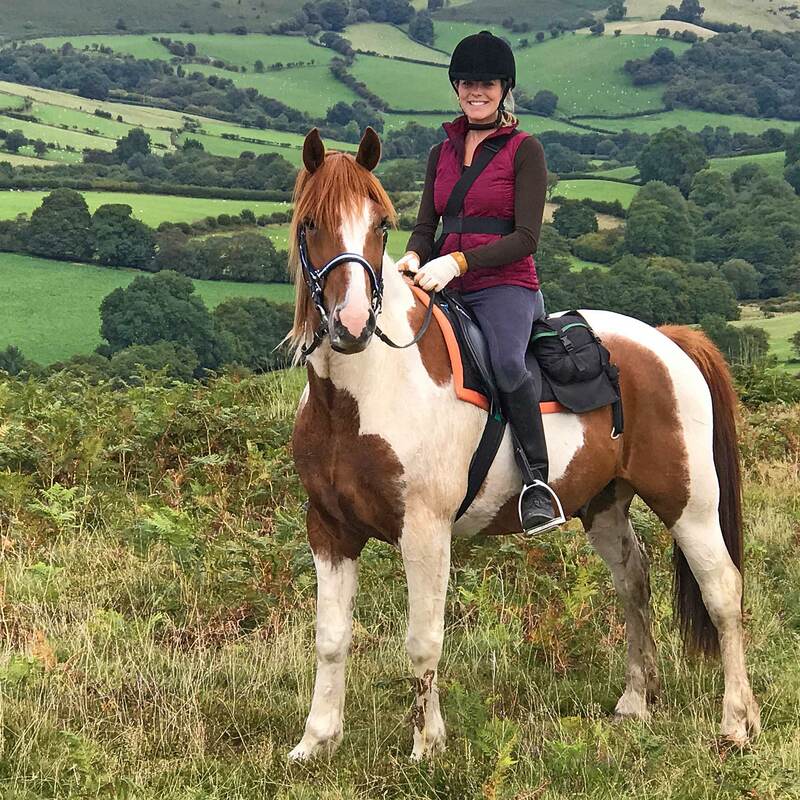 Ride through perfect horse country . .
On your first day you’ll travel over the Begwns through Painscastle and on to either Newhouse Farm or Cwmfillo guest houses for your first night. From there the route takes you north and eastwards towards the New Radnor plain and your second nights stay at either the Harp Inn Old Radnor or Bracken Ridge B&B. The trail swings north from Old Radnor and over towards Radnor Fforest (the most elevated point in Powys) landing gently at the Lower Fishpools small holding where a warm welcome awaits riders and horses alike. From Fishpools you travel along Radnor Fforest’s western side and eventually traverse down to stay at either Glanoer or Bettws, or Bettws Mill. You’ll explore Gwaunceste Hill on the fifth day of the trail before continuing onwards for your overnight stop at either Goblaen or Newgate Guest Houses. The length of Llanbedr hill awaits the following morning, followed by a night on the banks of the River Wye at Llyswen staying at either the Wye Knot Stop B&B, or slightly further on in Felinfach at the Old Mill. Your last day brings you back to Freerein HQ. Well done! 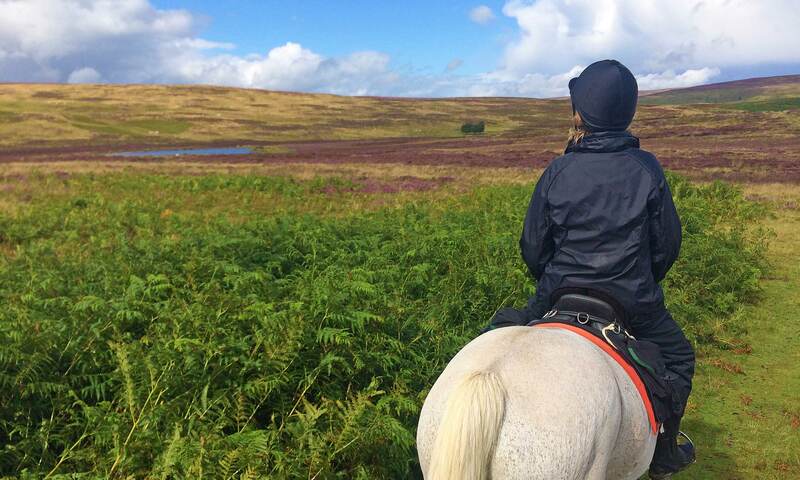 This is an absolute favourite trail of Freerein customers and staff alike. Arrive at Freerein HQ at 9am. Pack saddle bags then prepare your horses. Go through your individual route pack & depart. Out on trail all day to Cwmfillo or the Old Rectory. Arrive at your accommodation, untack, feed & turn your horses out in the field. Feed, groom and tack up your horse. Out on trail all day to the Harp Inn/Bracken Ridge B&B. Feed, groom and tack up your horse. Out on trail all day to Fishpools. Feed, groom and tack up your horse. Out on trail all day to Glanoer or Bettws. Feed, groom and tack up your horse. Out on trail all day to Old Rectory Guest House. Feed, groom and tack up your horse. Out on trail all day to Wye Knot Stop B&B. We loved the whole experience and the route was brilliant. What a sense of achievement . . .
Freerein Chester knows how to pose for the camera!